These hand built, made in America AES/EBU cables are a balanced digital interconnect cable. The standard was developed by the Audio Engineering society and the European Broadcast Union. Our cables use a quality 110 ohm American made Belden™ 1800F cable in a flexible PVC jacket. While these cables normally use male to female XLR’s, we can build other variations upon request. For longer lengths, email Tom@cablesforless.com for a quote. We use quality Neutrik™ black and gold XLR connectors that use a cable chuck arrangement as well as a rugged zinc die-cast shell. 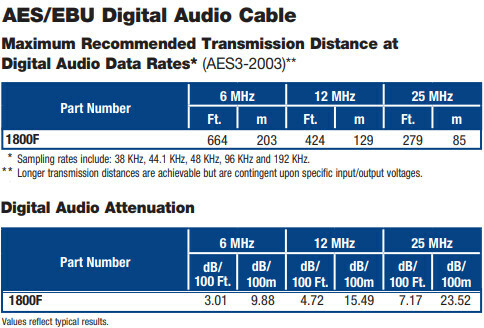 Twisted Pair Parameters The AES/EBU specification, with its broad impedance tolerance, allows for cables with impedances from 88 ohms to 132 ohms to be used, with 110 ohms being ideal. While twisted pairs with foil shields are commonly used, the option of UTP, unshielded twisted pairs, such as Category 5e, Category 6 or Category 6A is also common. Braid shields such as Belden 1800F are better for flexing applications, such as patch cables. The cables are terminated with either XLR connectors or are punched down or soldered in patch panels. Most digital audio cables utilize foam polyethylene to minimize the cable’s size. Standard foam polyethylenes are susceptible to crushing which can change impedance. Belden cables utilize a special foam high-density polyethylene that provides exceptional crush resistance when compared to standard foam insulation. The advent of digital microphones requires AES/EBU cable designs with added flexibility, such as Belden 1800F, a 110 ohm design featuring our ultra-flexible “French Braid” construction.